Charing Cross and Rail Station, 1880s . 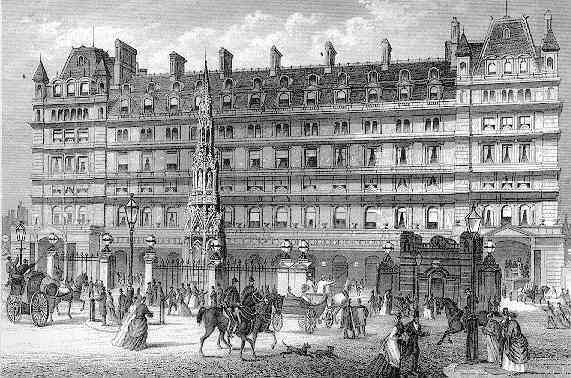 Charing Cross Station and Hotel, a minute's walk from Trafalgar Square, is an important Victorian railway stations. The station itself was built by the engineer John Hawkshaw in 1863, and the Renaissance-style hotel facing the Strand is by the architect E. M. Barry. It is large, very rectangular, and stands five storeys above the ground floor station. There is no central grand entrance, but smallish ones left and right. That on the left is to the Hotel, that on the right to the station, bearing a small pediment with shield, lion, griffin and motto 'Onward'. Nice ironwork of decreasing ornateness proceed upwards floor to floor. The site was previously occupied by Hungerford market, itself established in a somewhat curious fashion. Sir Edward Hungerford, heir to the vast Hungerford fortune, had a huge mansion on the site in the 17th Century. He squandered the money built up over centuries on living the good life, and had to sell a total of 28 manors to fund his gambling. His London residence burnt down in 1669, after a careless serving girl left some candles burning. Sir Edward, anxious for new potential sources of income, managed to get permission to hold a market on the site, and this was the Hungerford Market, eventually housed in a building by the architect of Covent Garden until the area was cleared for the station. Sir Edward Hungerford, incidentally, though he did not die rich, apparently lived to the ripe age of 115. The actual cross in front of the station (Eleanor Cross) is not the original one, which was one of at least nine and perhaps as many as 15 put up by King Edward I in memory of Queen Eleanor. The first cross was of wood, and afterwards a monumental one of Caen stone, carved with figures and raised on steps of marble, was put up. That cross stood where the equestrian Charles I now stands on its little traffic island in Trafalgar Square, and was demolished in 1647, and some of the stone apparently used to make paving along Whitehall. However, in 1863 the current cross was erected, based as closely as possible on what was known about the medieval one. It was designed by Barry and sculpted by the not particularly eminent Thomas Earp. It is an ornate thing, with eight crowned statues of Queen Eleanor above, eight kneeling angels at their feet, and shields lower down copied from extant crosses at Waltham and Northampton. 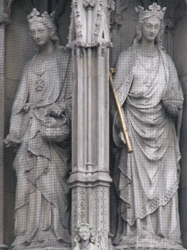 Other carving on the cross is based on 13th Century remains. 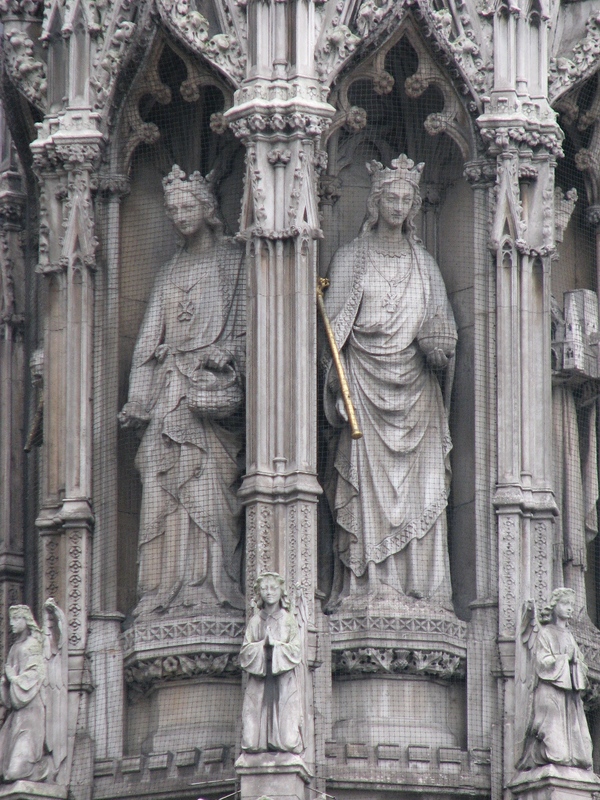 Much more regarding Eleanor Crosses and their sculpture is on this page. From here, one can walk along the Strand and Fleet Street through to St Pauls, seeing some sculpture along the way. Two of Earp's Eleanors .